Survivin is a member of the inhibitor of apoptosis protein (IAP) family containing a single baculovirus IAP repeat domain. It is expressed during fetal development but becomes undetectable in terminally differentiated normal adult tissues. We previously reported that survivin and its splicing variant survivin-2B was expressed abundantly in various types of tumor tissues as well as tumor cell lines and was suitable as a target antigen for active-specific anti-cancer immunization. Subsequently, we identified an HLA-A24-restricted antigenic peptide, survivin-2B80-88 (AYACNTSTL) recognized by CD8+ cytotoxic T lymphocytes (CTLs). We, therefore, started a phase I clinical study assessing the efficacy of survivin-2B peptide vaccination in patients with advanced or recurrent colorectal cancer expressing survivin. Vaccinations with survivin-2B peptide were given subcutaneously six times at 14-day intervals. Of 15 patients who finished receiving the vaccination schedule, three suffered slight toxicities, including anemia (grade 2), general malaise (grade 1), and fever (grade 1). No severe adverse events were observed in any patient. In 6 patients, tumor marker levels (CEA and CA19-9) decreased transiently during the period of vaccination. Slight reduction of the tumor volume was observed in one patient, which was considered a minor responder. No changes were noted in three patients while the remaining eleven patients experienced tumor progression. Analysis of peripheral blood lymphocytes of one patient using HLA-A24/peptide tetramers revealed an increase in peptide-specific CTL frequency from 0.09% to 0.35% of CD8+ T cells after 4 vaccinations. This phase I clinical study indicates that survivin-2B peptide-based vaccination is safe and should be further considered for potential immune and clinical efficacy in HLA-A24-expression patients with colorectal cancer. Most patients who undergo operations for advanced colorectal cancer remain at high risk for local or systemic recurrence, and current chemotherapy or radiotherapy regimens have limited efficacy in preventing recurrence. Hence, advances in new therapeutic modalities for patients with advanced or recurrent colorectal cancer are urgently needed, one of which is tumor-specific immunotherapy. Tumor cells express antigens that can be recognized by the host's immune system. T cells recognize antigens in the form of short peptides binding to major histocompatibility complex (MHC) molecules . Following the first report of the cloning of a human tumor antigen gene, termed melanoma antigen-1 (MAGE-1) in 1991 , a nonapeptide encoded by this gene was identified that could be recognized by HLA-A1-restricted CTLs . To date, a large number of antigenic peptides have been identified from melanoma and other cancers, and clinical trials of peptide-based immunotherapy for cancer have taken place. Melanoma antigen peptides were the first to be tested in phase I and phase II studies for active immunization of metastatic melanoma patients [2, 4]. In some studies, clinical responses have been observed in 10–30% of the patients treated . Rosenberg et al. reported that clinical responses were observed in 42% of patients with metastatic melanoma receiving a modified gp100 peptide (gp100-209.2M) and systemic high dose of IL-2 . Since then, various cancer vaccine trials are ongoing in the United States and Europe . Survivin was identified as a member of the inhibitor of apoptosis protein (IAP) family with a single baculovirus IAP repeat domain . Survivin is present during fetal development but undetectable in terminally differentiated normal adult tissues except for certain cells such as proliferating endothelial cells and activated lymphocytes. In contrast to normal tissues, survivin is abundantly expressed in transformed cell lines and in most common cancers, including colorectal cancer . We previously reported that survivin-2B, a splicing variant of survivin was also expressed in various types of tumor cell lines9, and the survivin-2B80-88 (AYACNTSTL) peptide derived from exon 2B-encoded region was recognized by CD8+ CTLs in the context of HLA-A24 molecules . CTLs specific for this peptide were successfully induced from peripheral blood mononuclear cells (PBMCs) in 6 out of 7 HLA-A24+ patients (83%) with colorectal cancers and exerted cytotoxicity against HLA-A24+ / survivin+ adenocarcinoma cells . On the basis of these observations, we have started a phase I clinical study of survivin-2B peptide vaccination for patients with advanced or recurrent colorectal cancer. Our present study demonstrated safety and suggested marginal clinical effectiveness of the survivin-2B peptide vaccination in colorectal cancer patients. The study protocol was approved by the Clinic Institutional Ethical Review Board of the Medical Institute of Bioregulation, Sapporo Medical University, Japan. All patients gave informed consent before being enrolled. Patients enrolled in this study were required to conform to the following criteria: (1) to have histologically confirmed colorectal cancer, (2) to be HLA-A*2402 positive, (3) to be survivin-positive in the carcinomatous lesions by immunohistochemistry, (4) to be between 20 and 85 years old, (5) to have received surgical excision of the primary with curative intent and (6) to have ECOG performance status between 0 and 3. Exclusion criteria included (1) prior cancer therapy, such as chemotherapy, radiation therapy, steroid therapy, or other immunotherapy within the past 4 weeks, (2) presence of other cancers that might influence the prognosis, (3) immunodeficiency or a history of splenectomy, (4) severe cardiac insufficiency, acute infection, or hematopoietic failure (5) ongoing breast-feeding, (6) unsuitability for the trial based on clinical judgment. This study was carried out at the Department of Surgery, Sapporo Medical University Primary Hospital from March 2003 through December 2003. The peptide, survivin-2B80-88 with the sequence AYACNTSTL, was prepared under good manufacturing practice conditions by Multiple Peptide Systems (San Diego, CA). The identity of the peptide was confirmed by mass spectral analysis, and the purity was shown to be more than 98% as assessed by high pressure liquid chromatography analysis. The peptide was supplied as a freeze-dried, sterile white powder. It was dissolved in 1.0 ml of physiological saline (Otsuka Pharmaceutical Co., Ltd., Tokyo, Japan) and stored at -80°C until just before use. The vaccination schedules were as follows. Vaccinations with survivin-2B peptide were given subcutaneously (s.c.) six times at 14-day intervals. In order to set up a dose-escalation trial, the patients were separated into the following three groups: group 1 patients received 0.1 mg, group 2 received 1.0 mg and group 3 received 10 mg. Each group included five patients. Escalation to the next dose was allowed if side effects did not exceed grade 3. Delayed-type hypersensitivity (DTH) skin test was performed at each vaccination. The peptide (10 μg) solution in physiological saline (0.1 ml) or physiological saline alone (0.1 ml) were separately injected intradermally (i.d.) into the forearm opposite to the vaccination site. A positive reaction was defined as a more than 4 mm diameter area of erythema and induration 48 hr after the injection. Patients were examined closely for signs of toxicity during and after vaccination. Adverse events were recorded using the National Cancer Institute Common Toxicity Criteria (NCI-CTC). Physical examinations and hematological examinations were monitored before and after each vaccination. Tumor markers (CEA and CA19-9) were examined monthly. Tumor size was evaluated by computed tomography (CT) scans or MRI before treatment, after three vaccinations and at the end of the study period. A complete response (CR) was defined as complete disappearance of all measurable and evaluable disease. A partial response (PR) was defined as a >= 50% decrease from the baseline in size of all measurable lesions (sum of products of maximal perpendicular diameters) lasting at least 4 weeks. Progressive disease (PD) was defined as an increase in the sum of the bi-dimensional measurements of all known disease sites by at least 25% or the appearance of new lesions. No change (NC) was defined as the absence of matched criteria for CR, PR, or PD. In addition, one case that was defined as NC but reached a nearly PR, was recorded as minor response (MR). Therefore, a MR was defined as > 50% decrease from the baseline in all measurable lesions (sum of products of maximal perpendicular diameters) lasting less than 4 weeks or as a 25% to 50% decrease from the baseline in all measurable lesions (sum of products of maximal perpendicular diameters) lasting at least 4 weeks. Patients who received less than six vaccinations were excluded from all evaluations in this study. HLA-A24/peptide tetramers were constructed according to the procedure described by Altman et al. . Briefly, recombinant HLA-A24 heavy chain  and human β-2-microgloblin were refolded with survivin-2B80-88 peptides as described before . The resulting HLA-A24-peptide monomer was biotinylated by incubation with BirA enzyme (Avidity, Denver, CO) for 17 hr at room temperature and purified using fast protein liquid chromatography. Tetrameric HLA-peptide complex was produced by incubating streptavidin-PE (Vector Laboratories, Burlingame, CA) with the biotinylated monomer at a 1:4 molar ratio. 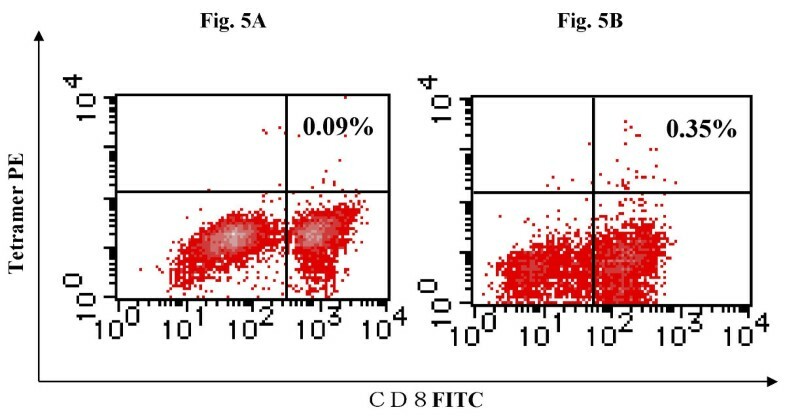 For flow cytometric analysis, PBMCs were isolated from blood samples by Ficoll-Conray density gradient centrifugation, and stained with PE-labeled tetramer at 37°C for 20 min, followed by staining with FITC-conjugated anti-CD8 mAb (Beckton Dickinson Biosciences) at 4°C for 30 min. Cells were washed twice with PBS before fixation in 1% formaldehyde. Flow cytometric analysis was performed using FACSCalibur and Cell Quest software (BD Biosciences). The frequency of CTL precursors was calculated as the number of tetramer-positive cells over the number of CD8-positive cells. ELISPOT plates were coated sterilely overnight with IFN-γ capture antibody (Beckton Dickinson Biosciences) at 4°C. The plates were washed once and blocked with AIM-V medium containing 10% human serum for 2 hr at room temperature. CD8-positive T cells separated from patients' PBMCs (5 × 103 cells/well) were then added to each well along with HLA-A24-transfected CIR cells (CIR-A24) (5 × 104 cells/well), which had been pre-incubated with or without survivin-2B80-88 peptides (10 μg/ml). After incubation in a 5% CO2 humidified chamber at 37°C for 24 hours, the wells were washed vigorously five times with PBS and incubated with biotinylated anti-human IFN-γ antibody and horseradish peroxidase-conjugated avidin. Spots were visualized and analyzed by KS ELISPOT (Carl Zeiss, Germany). Seventeen patients were initially enrolled in the study (Table 1), but two (case 4 and 15) discontinued halfway through the protocol. One patient (case 4) had lung and brain metastases from rectal cancer and was removed from the study after 2 vaccinations since he required steroid therapy to suppress cerebral edema resulting from brain metastasis. Another patient (case 15) had lung metastases, liver metastases and carcinomatosis from colon cancer. He was removed from the study after 4 vaccinations because of exacerbated dyspnea resulting from advanced pulmonary metastases. Neither of the treatment interruptions were due to the adverse effects of the vaccination. Fifteen patients received the complete regimen including six vaccinations and were evaluated. They included 9 men and 6 women, whose average age was 59 years (range, 42–72). In for 4 cases colon cancer was the primary diagnosis and the remaining 11 cases resulted from rectal cancer. Peptide vaccination was well tolerated in all 15 patients. Three patients (case 1, 6, and 12) had slight toxicity-associated symptoms such as anemia (grade 2), general malaise (grade 1) and fever (grade 1). Case 1 developed anemia after the second vaccination. Case 6 and case 12 experienced general malaise and fever after each vaccination followed by spontaneous recovery within a few days. No serious adverse events were observed during or after vaccination. Table 1 summarizes the clinical outcomes for the 15 patients. In 6 patients (case 1, case 3, case 5, case 6, case 7, case 9) tumor marker levels (CEA and CA19-9) transiently decreased or at least did not increase during vaccination (Table 2). A minor response was observed in one patient (case 1) who also demonstrated a decrease in CEA level. Three patients (case 3, 11, 17) were considered NC and the remaining 11 PD. It was noted retrospectively that all six patients in whom a decrease in tumor marker level was observed had received some sort of adjuvant chemotherapy after resection of the primary tumor without additional chemotherapy after recurrence (Fig. 1). The details are as follows: case 1 has received a daily dose of 600 mg tegafur/uracil (UFT) for eight months as oral adjuvant chemotherapy. He stopped receiving the drug at his own request. Case 3 received tegafur/uracil (UFT) at a daily dose of 600 mg for two years as oral adjuvant chemotherapy. He discontinued the medicine due to severe nausea. Case 5 received 5-FU at a daily dose of 200 mg for three years as oral adjuvant chemotherapy. Case 6 received 2 courses of CPT-11 (40 mg/day on the day 1, 8 and 15) every 4 weeks as adjuvant chemotherapy. Subsequently, the patient discontinued the treatment because of an increase in tumor markers and a recurrence in the pleural cavity. Case 7 received 2 courses of leucovorin (750 mg/day on the day 1, 8 and 15) and 5-FU (250 mg/day on the day 1, 8 and 15) every 4 weeks as adjuvant chemotherapy. The patient discontinued the treatment due to toxic effects that included severe nausea, loss of appetite, and gastritis. Case 9 had been treated with CPT-11 (40 mg/day) once a week and 5'-DFUR (800 mg/day) every day for a year as adjuvant chemotherapy. After recurrence, all patients were treated with peptide vaccination without additional chemotherapy. Interestingly, the patients who showed no decrease in tumor markers received additional chemotherapy after recurrence and prior to vaccination. It is possible that the additional chemotherapy might have interfered with the vaccine. Treatment history of six patients who experience decrease in tumor marker levels during immunization. Case 1 has received tegafur/uracil (UFT) at a daily dose of 600 mg for eight months as oral adjuvant chemotherapy. 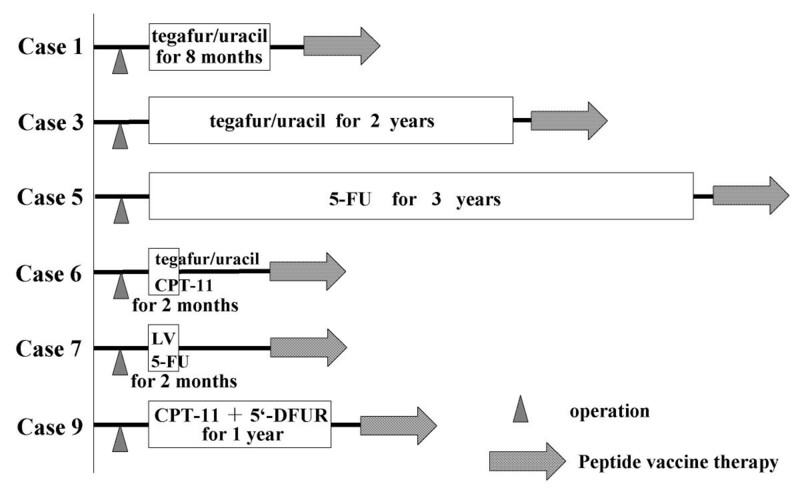 Case 3 received tegafur/uracil (UFT) at a daily dose of 600 mg for two years as oral adjuvant chemotherapy. Case 5 received 5-FU at a daily dose of 200 mg for three years as oral adjuvant chemotherapy. Case 6 received 2 courses of CPT-11 (40 mg/day) every 4 weeks as adjuvant chemotherapy. Case 7 received 2 courses of leucovorin (750 mg/day) and 5-FU (250 mg/day) every 4 weeks as adjuvant chemotherapy. Case 9 was treated with CPT-11 (40 mg/day) weekly and 5'-DFUR (800 mg/day) for a year as adjuvant chemotherapy. They all had recurrences after the above adjuvant chemotherapy and received peptide-based vaccination without additional chemotherapy. Among four patients who were defined as NC or MR, two (case 1 and case 3) experienced decreases in tumor markers while the other two (case 11 and case 17) did not. In case 11, levels of CEA have stayed within the normal range (0~5.9 ng/ml) until the 4th vaccination and increased thereafter (Fig. 2A). while CA19-9 levels stayed within the normal range (0~37 U/ml) throughout the study (Fig. 2B). Changes in serum tumor marker levels during the study in case 11 (A: CEA, B: CA19-9). Levels of CEA stayed within the normal range (0~5.9 ng/ml) until the 4th vaccination, and increased thereafter (A). Levels of CA19-9 stayed within the normal range (0~37 U/ml) throughout the study (B). Arrows indicate the times of vaccination. Case 1 was a 63-year-old man who had advanced rectal cancer. He underwent low anterior resection, followed by receiving tegafur/uracil (UFT) at a daily dose of 600 mg as adjuvant chemotherapy for one year. At his own request, administration of the drug was discontinued. Three months later, he self referred himself with pygalgia. CT scan imaging demonstrated one lung metastasis, a tumor in the pelvis and a mass in the urinary bladder. Cystoscopy revealed that the bladder lesion was related to prostate hypertrophy while colonoscopy confirmed recurrent tumor in the pelvic cavity. The primary rectal cancer was confirmed by immunohistochemical staining to express survivin and the vaccination was started in March 2003. CEA and CA19-9 were 15.9 ng/ml and 152.4 U/ml respectively before treatment. They decreased continuously until the 5th vaccination, at which points CEA and CA19-9 reached lowest levels, 6.5 ng/ml and 64.2 U/ml, respectively. After the 6th vaccination, however, they returned to increase to 16.2 ng/ml and 128.9 U/ml, respectively (Fig. 3A and 3B). After the 4th vaccination, CT scan imaging revealed 32% reduction in volume of the recurrent pelvic tumor (Fig. 4A and 4B) while rectal bleeding disappeared after the 2nd vaccination. Changes in serum tumor marker levels during the study in case 1 (A: CEA, B: CA19-9). Levels of CEA and CA19-9 were 15.9 ng/ml and 152.4 U/ml, respectively before vaccination. Levels decreased continuously until the 4th or 5th vaccination to 6.5 ng/ml and 64.2 U/ml, respectively. However, they increased to 16.2 ng/ml and 128.9 U/ml respectively after 6th vaccination. Arrows indicate the times of vaccination. CT scan image of the pelvis of patient reported as case 1 (A: before vaccination, B: after the 4th vaccination). The CT scan image demonstrates a reduction of tumor volume in the pelvic cavity after the 4th vaccination compared with before vaccination (32% reduction). The tumor had spread to the gluteus maximus muscle before treatment (white arrow in Panel A), whereas it appears separated from the muscle (white arrow in Panel B) after vaccination. The asterisk (*) indicates prostate hypertrophy. The sharp-mark (#) indicates a recurrent tumor in the pelvic cavity. DTH skin test was performed at each vaccination and assessed 48 hr later. A positive reaction was defined as erythema and induration of more than 4 mm diameter. In 6 out of 15 patients (40%), a positive DTH reaction was observed at least once during the study. In order to examine if the survivin-2B peptide vaccine could bring about a specific immune response in the patients, we analyzed the peptide-specifc CTL frequency by using HLA-A24/peptide tetramer. Survivin-2B peptide-specific CTL frequencies in PBMCs remained at background levels (less than 0.1 %) in all cases except for case 17. In case 17, the frequency of tetramer-positive CTL was increased from 0.09% to 0.35% after the 4th vaccination (Fig. 5). ELISPOT assay of CD8-positive T cells separated from the patients' PBMCs failed to show the peptide-specific IFN-γ response in any patients (data not shown). Overall this study suggests that the vaccination approach that we attempted may provide marginal if any immunological or clinical benefit. However, it is possible that further studies that may include a more intense immunization schedule, delivery in the presence of adjuvant and/or the combination of immune stimulatory cytokines may enhance the activity of survivin as an immunogen against cancer. Tetramer analysis of PBMCs from case 17. Lymphocytes were collected from peripheral blood of the patient reported as case 17 before the 1st vaccination (A) and after the 4th vaccination (B), stained with FITC-labeled antiCD8 mAb and PE-labeled HLA-A24/survivin 2B peptide tetramer, and analyzed by flow cytometry. The frequency of tetramer-positive CTL was increased from 0.09% to 0.35% of CD8+ T cells after the 4th vaccination. Recently, a large number of tumor antigens and epitopes recognized by cytotoxic T lymphocytes (CTLs) have been identified, and reports of clinical trials utilizing peptide vaccination are increasing [2, 14–16]. However, most clinical trials were aimed at the treatment of advanced melanoma, and there are few reports of clinical trials for patients with solid gastrointestinal tract cancer. Therefore, we attempted to identify tumor antigens that are expressed in a wide variety of solid gastrointestinal tract cancers. We demonstrated that survivin was expressed in a large proportion of colorectal and gastric cancer specimens, and the survivin-2B-derived peptide could induce CTL response in the context of HLA-A24 [9, 10]. In addition, we showed an elevation in CTL precursor frequencies in PBMCs of HLA-A24+ cancer patients by using HLA-A24/survivin-2B peptide tetramer. On the basis of the above studies, we started a phase I clinical study of survivin-2B peptide vaccine therapy for patients with advanced or recurrent colorectal cancer in March 2003. In many clinical trials, patients received the peptide in combination with certain adjuvant, such as IFA and cytokines, for the purpose of enhancing immune responses against cancer. In this study, patients received the survivin-2B peptide dissolved in physiological saline without any adjuvant in order to strictly evaluate the clinical effect of the peptide alone. A dose-escalation trial was chosen to estimate a safe and optimal dose. 0.1 mg, 1.0 mg, and 10.0 mg dosage groups, each consisting of five patients, were set up. Of the patients in the 0.1 mg dose group, mild side effects were observed in two patients, such as general malaise (grade 1) and anemia (grade 2). None of the patients receiving 1.0 mg had any sign of toxicity, and one of the patients in the 10.0 mg dose group had slight fever (grade 1). No greater than grade 3 toxicity was observed. Thus, we conclude that the survivin-2B peptide vaccine is safe and can be repeatedly injected into patients without serious side effect. In addition, there was no correlation between toxicity grade and dosage within the range of 0.1 mg to 10 mg. In terms of clinical response, levels of tumor markers were temporarily decreased compared with pre-treatment in four patients in the 0.1 mg dosage group and two patients in the 1.0 mg dosage group. No patients in the 10.0 mg dosage group experienced decrease in tumor markers. In addition, a minor response was observed in one patient who received 0.1 mg. Thus, there appeared to be no correlation between clinical outcome and vaccine dosage. Positive DTH reaction was observed in 6 out of 15 patients (40%) at least once during the vaccination. A previous report suggested a positive correlation between DTH and clinical responses . In this study, however, neither level of tumor marker or tumor size were associated with positive DTH reaction, except for one case (case 6). In this study, six patients (case 1, case 3, case 5, case 6, case 7, case 9) had temporary decreases in the level of tumor markers. It was noted that they had a history of adjuvant chemotherapy after operation, and no additional chemotherapy after recurrence while all the other patients received various kinds of chemotherapy after recurrence, prior to the vaccine treatment. Although our study consisted of only a limited number of patients, these preliminary data may suggest that peptide-based vaccines might be more effective in patients not immune-suppressed by recent chemotherapy. Patient in case 17 had advanced rectal cancer and was operated on for creating a stoma without resection of the tumor. Though the levels of tumor markers continued to increase during the study, HLA-A24/peptide tetramer analysis of CD8+ T cells in PBMCs suggested a minor increase in frequency of peptide-specific CTL after the 4th vaccination (approximately four-fold). It is possible that this the CTL response induced by the vaccine might not be sufficient to induce clinical regression in a patient with advanced or the tetramer-positive CTL might be suppressed in their cytotoxic function. Though immunological monitoring has been executed using tetramer assay in the other cases, tetramer-positive CTL frequencies were under the detection limits even after the 6th vaccination. It is obvious that a sensitivity of the assay has to be increased to detect the specific CTL in patients' PBMCs. In some reports, patients' PBMCs were stimulated with peptides in the presence of IL-2 in vitro for several days before tetramer assay. In our present immune monitoring study, we examined the CTL frequencies without such in vitro expansion since it was anticipated that such an approach might not be representative of the naturally occurring immune response against the peptide in vivo. This phase I clinical study revealed that the administration of the survivin-2B peptide is safe. It is obvious that superior clinical and immunological responses are necessary for cancer immunotherapy. Though vaccination with survivin-2B peptide alone was not enough to elicit overt clinical responses, it is possible that vaccination with peptide in combination with adjuvants or cytokines may be able to lead to higher immune responses both in the induction phase and in the effector phase. On the basis of the information obtained from this study, we have recently started the second clinical study of survivin-2B peptide vaccine in combination with various adjuvants such as IFA, GM-CSF, IL-2 and IFN-α.